Style Notes! 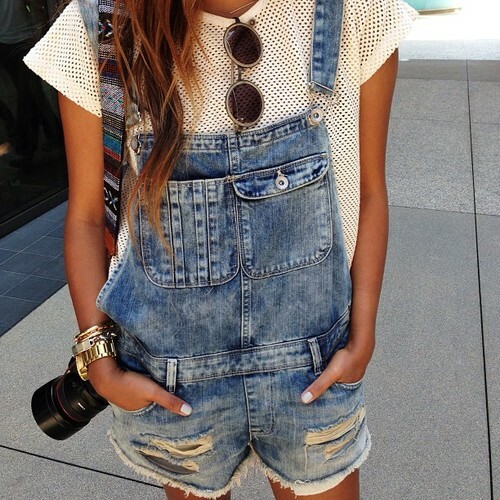 Unless you've been living underneath a giant rock, I'm sure you heard that overalls made a huge comeback this spring. Yup, you read right, overalls -- "bib-and-brace" -- overalls. And while I'm not too sure if I'd rock the trend (more leaning towards a no) I'm really starting to find them exceptionally cutesy, thanks to the featured picture. Home-Girl wearing the overalls (above) is showing us that she's embracing the trend as she pairs it with a cool white mesh short sleeve shirt. But, I particularly like that the overall is distressed denim, which is certainly a spruce-up ingredient adding some fashionable flavor to mix. Moreover, peep her manicure! It's clean and simple yet stands out whilst complementing the entire outfit. And the camera? It's so statement.